Of all the regional cuisines in China, there are 8 that are very popular. 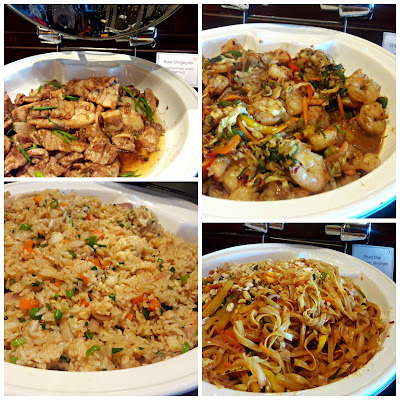 These cuisines are from the regions of Sichuan, Guangdong (Canton), Zhejiang, Hunan, Jiangsu, Fujian, Shandong and Anhui. Except for Sichuan and Hunan (known as the "spicy provinces), the others are located along the east of the country. 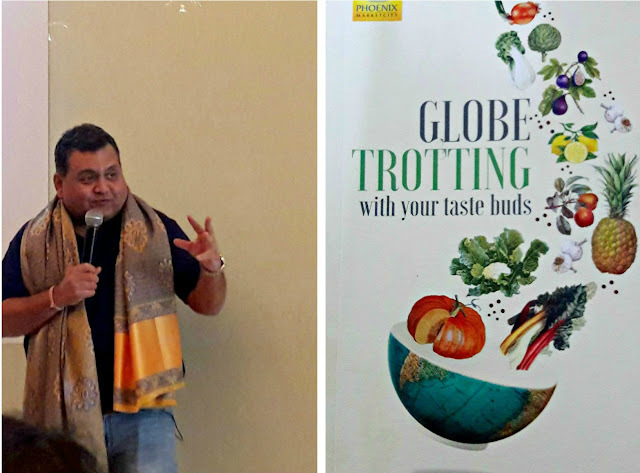 The cuisine of each province varies with the geographical location, climatic conditions and ingredients. 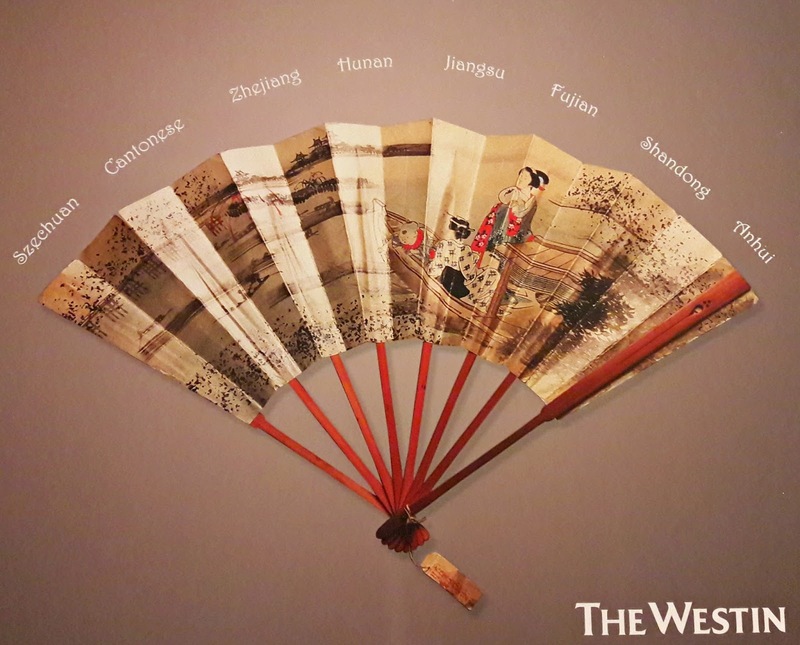 Westin Velachery Chennai is promoting the "8 Treasures" Food Festival at 5 Sen5es, their Pan-Asian restaurant - quite an ambitious project for a city which loves its heavily Indianised version of Chinese food. Things do taste different when an executive chef who has worked in China is in the kitchen. 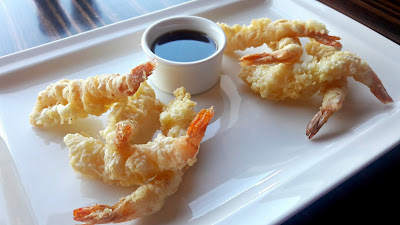 We had crisp fried dough strips tossed in a tangy garlicky sauce to nibble on (not a dish from any of the 8 provinces)! That ensured we went straight into the meal even though the chef did offer to get us sushi! 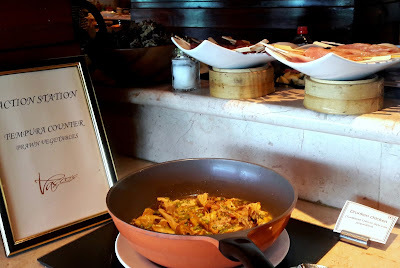 We were served a few specialities from some of the regions. We started with Anhui's Red Cooked Chicken, more brown than red! Red braising is a unique style of cooking where food is cooked in a mix of sugar, water, wine and soy, along with aromatics resulting in meat that has a reddish colour. 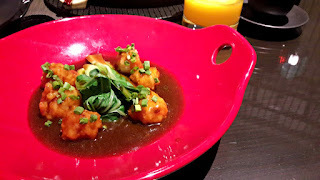 In this dish, the chicken was tender and the sauce was heady with the flavour of Shaoxing wine. The dash of chilli oil gave it a sharp bite and that was interesting. 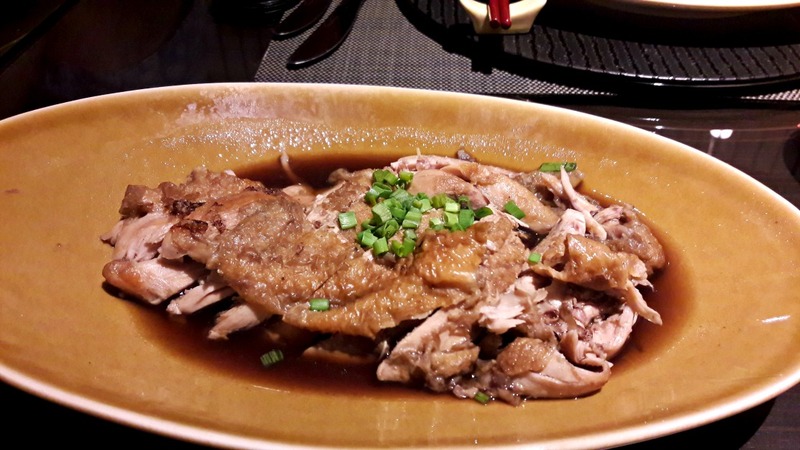 Dezhou Stewed Chicken is a Shandong cooking technique. The chicken had been stewed in an aromatic broth but the flavour of star anise was strident in an otherwise mellow dish. 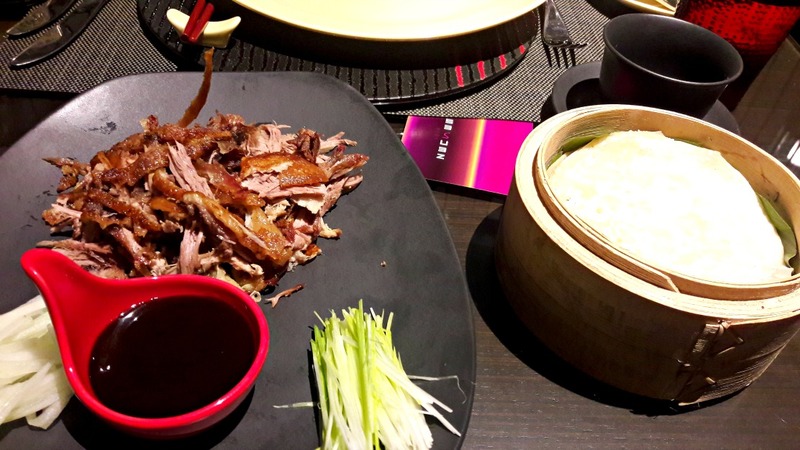 Zhejiang is famous for its duck dishes, Westin's take on it is the Crispy Aromatic Duck. Served with pancakes, the meat had been roasted and then shredded for service. There was also hoisin sauce and juliennes of leeks and cucumber. The pancake was a tad dry and the meat stringy but flavours were good. Fujian province is located along the coast and the cuisine features plenty of seafood dishes. 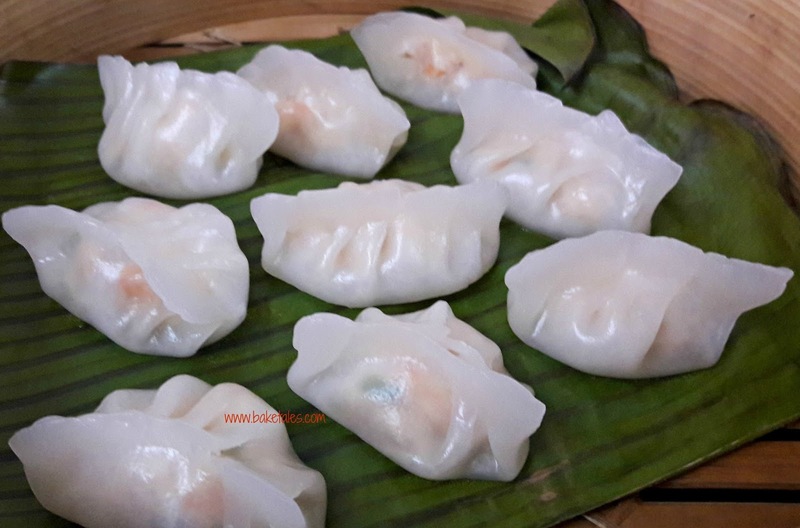 We had Tai Chi Prawns, minced prawn shaped into dumplings and lightly fried before being tossed in a dark soya-based sauce. Chinkiang vinegar gave the sauce a delicious tartness. A friend was a little sceptical of having them but then decided to give it a try and wasn't at all disappointed. 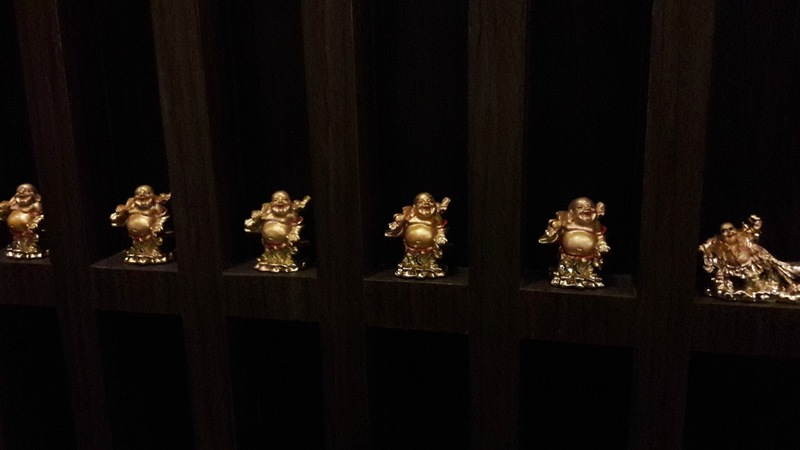 Eight treasures also has vegetarian dishes on the menu. My vegetarian friend was served Sichuan Shredded Potatoes. The potatoes were cut into finger lengths and had been tossed with some wickedly red chillies. 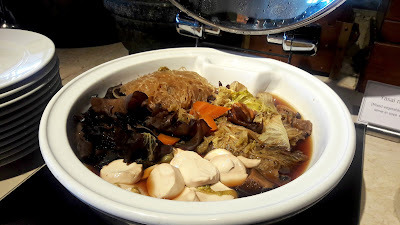 There was also Cantonese-style Stir-fried Cabbage with Minced Garlic - napa cabbage slices tossed in a light garlic and soya-based sauce. Delicious! The winner was Eggplant in Hot Garlic sauce. Even if you don't like the taste of eggplants, this one dish will convert you. 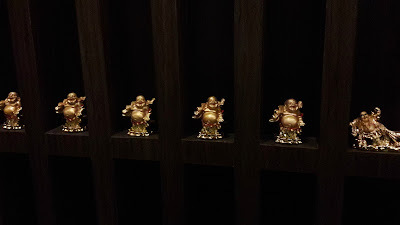 All these were served with sticky fried rice, a very simple dish with diced carrots, beans and egg. The grains of Jasmine rice were small and lent a wonderful fragrance. 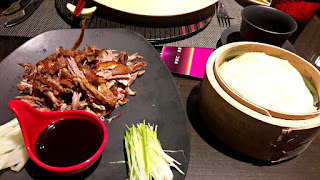 There was also steamed rice which is actually a better accompaniment to the main courses. Presentation of each of the dishes was disappointing. 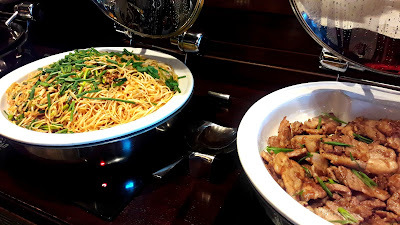 Other specialities are Lamb with Snow Peas (Cantonese), Sweet and Sour Mandarin Fish (Hunan), Braised Spare Ribs (Jiangsu) and Mapo Tofu (Sichuan). There is no festival dessert so we all opted for the pumpkin pudding that is on the restaurant's a la carte menu. A delicious serving of smooth pumpkin puree lightened with coconut milk. Pure bliss! 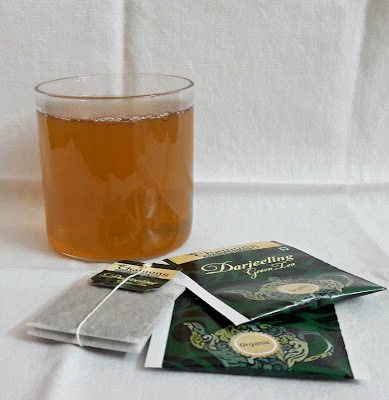 A couple of weeks ago, I received a message from a fellow blogger asking me if I would like to sample products from www.PlaceofOrigin.in and write about them. It took about 2 weeks for my parcel to reach me. 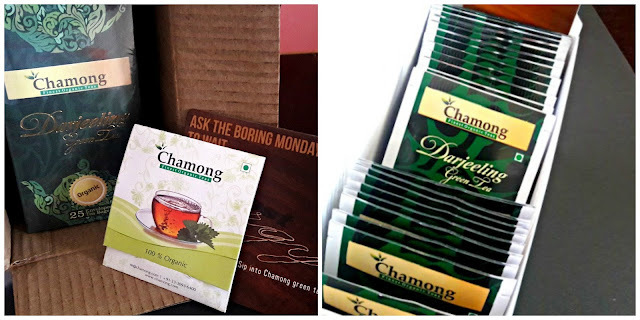 A small, sturdy cardboard box with Chamong printed all over the sticky tape and no indication if it was sent by Place of Origin. Inside was a box of Chamong Organic Darjeeling Green Tea sachets. 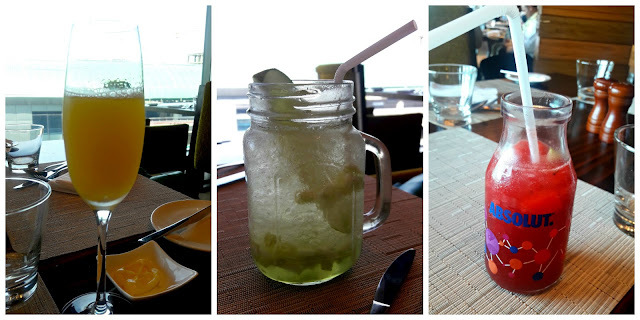 There was also a sleeve with a sachet each of Tulsi green tea and Lemon Splash, a flavoured green tea. All the tea bags are packed in individual foil-lined envelopes. Instructions to brew the perfect cup of tea are printed on the back of each packet. The manufacturing date is March 2016. The packaging was perfect, not even a crease on the tea box. 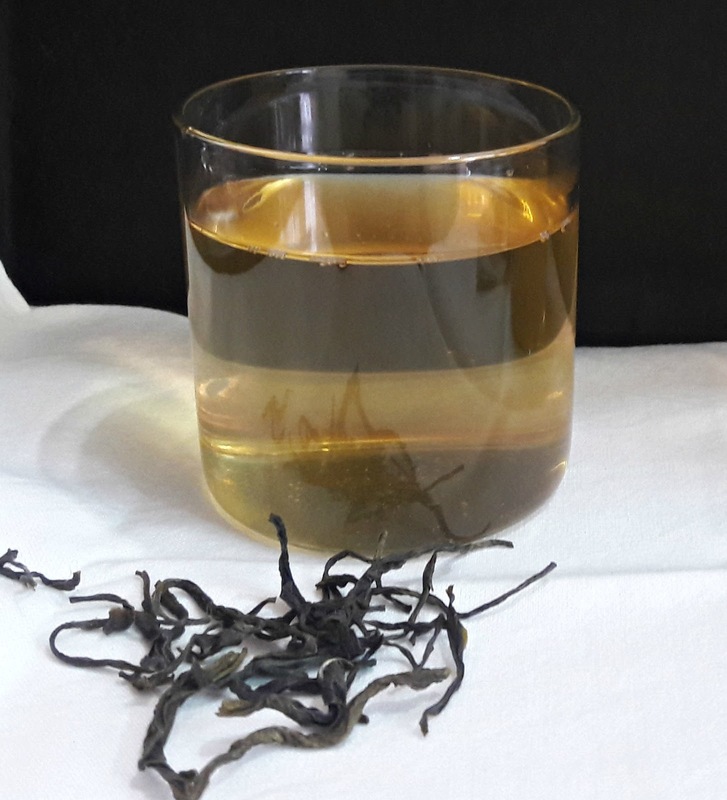 When brewed, the tea is golden coloured and slightly opaque. I liked the mild flavour and it's a refreshing drink. And I love my green tea with no additives and the convenience of using a tea bag. A few days later, a second box landed up. This time, "Place of Origin" was printed across the box. This box too held a packet of tea which arrived in perfect condition. This pack was from Bohag, an organic green tea company from Assam. 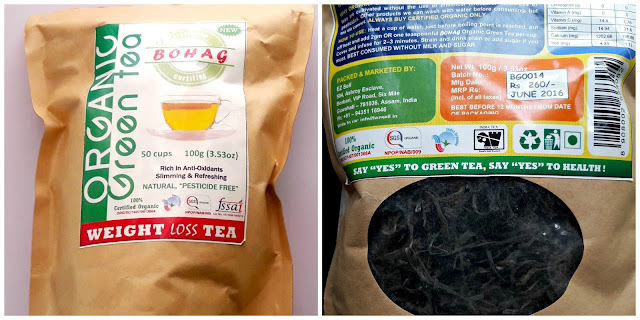 Shipped from Guwahati, the label stated it is a weight loss tea though there was nothing to substantiate the claim (everyone knows the benefits of green tea). Packed in a plastic-lined zip-lock pouch, there was a little window at the back which showed really long tea leaves. The organic certification number was printed on the pack and the manufacturing date is June 2016. Once again, the brewing method was printed on the back. Since the leaves are loose and long, it's quite difficult to measure out a teaspoon. 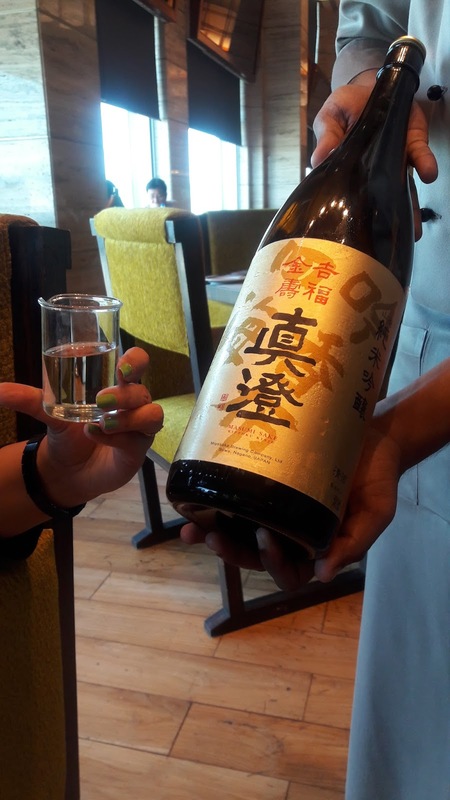 The resultant liquor is a pale gold in colour and clear. 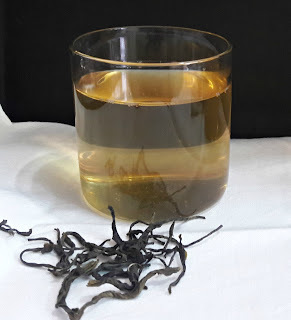 It had very little flavour, infusing it for 2 minutes resulted in an over-brewed tea with slight tannic notes. 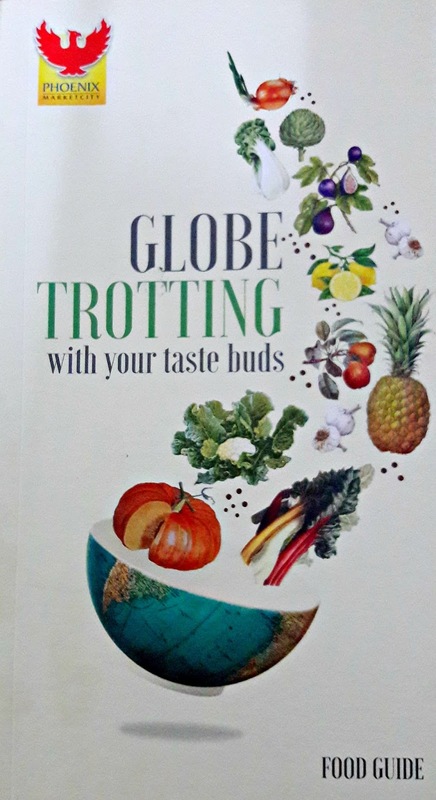 A little online reading revealed that the company, which describes itself as a "marketplace for speciality food" puts products from a geographical location in the hands of the end customer who could be located anywhere in India. For example, if you are at Chennai and have been craving chocolates from Ooty or Cherry Swiss cookies from Flurry's, Kolkata, all you need to do is go to the website and order it. There are options for vegetarians, those with gluten intolerance or nut allergies. There are also a whole lot of products called "Ramadan Foods". Just type in your pin code and you will know if delivery to your location is available. You can also find out the costs involved and how long it will take your parcel to reach you. Payment has to be made in advance and if you order stuff from 3 different places, you might receive them as 3 different shipments perhaps on the same day! 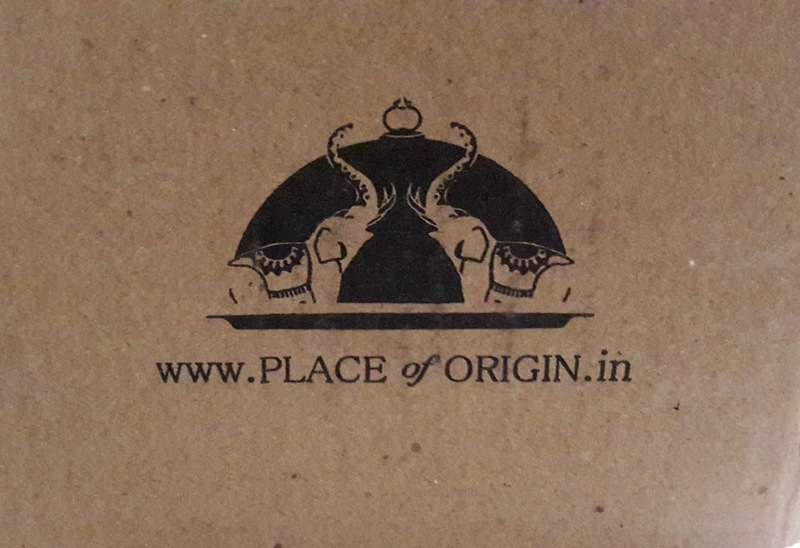 The next time you long to have authentic sweet mango pickle from Gujarat or some delicious soan papdi from Jammu, do go on to Place of Origin's website and place your order. 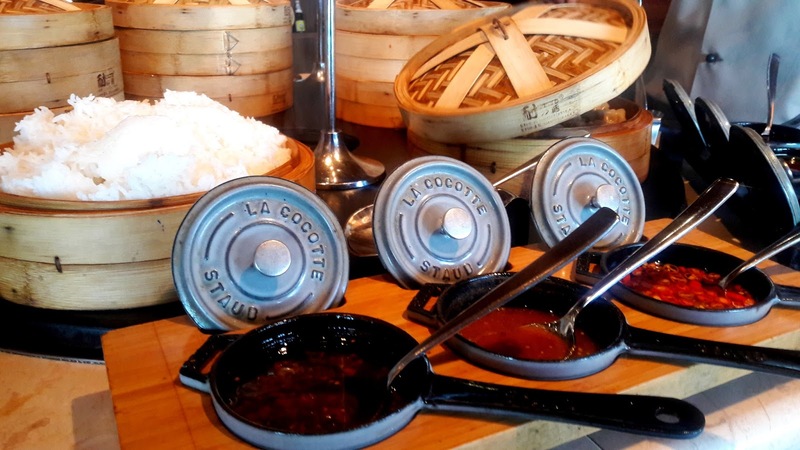 Small talk and nimble fingers - the perfect recipe for a well-made dimsum. 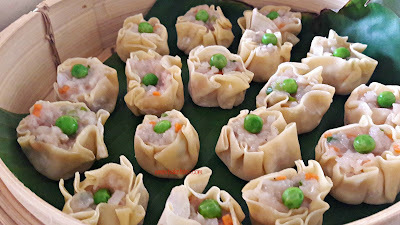 Pretty as a picture and all done by the ladies, these dimsums do certainly touch the heart! Andhra food is known to make grown people cry. Tears of happiness, no doubt, if you fancy spicy food. We were told the management preferred that we go for the food festival at lunchtime. That sounded ominous so I did the next best thing - took along a large box of tissues! Aloft Hotel sits at the Sholinganallur junction on the Old Mahabalipuram Road. The 6 year old 3-star property has become a landmark of sorts over the years. 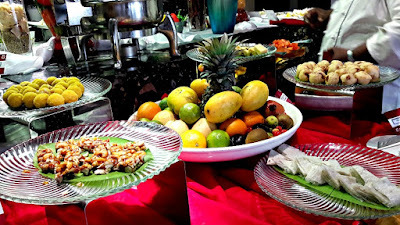 We had been invited to review the ongoing Kitchen Treasures - Andhra Food Festival at dot.yum, the buffet-style coffee shop. Strings of marigolds hang across the doorway leading to the cafe and it's a nice way to announce the presence of a food festival - sort of puts one in the mood. There are also blown up posters of a young and dashing N.T. Rama Rao from his acting days. Later, he went on to become the Chief Minister of Andhra Pradesh. dot.yum cafe is a comfortable place to be in on a summer afternoon. The staff were busy setting up the buffet counters but not too busy to bring me a cold and refreshing glass of watermelon juice while I waited for a fellow blogger. 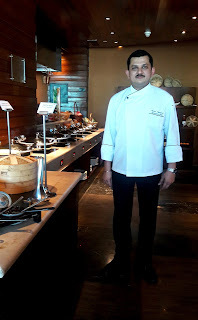 We were soon joined by F&B Manager Karthikeyan and Executive Chef Ashokkumar who took us around the buffet. 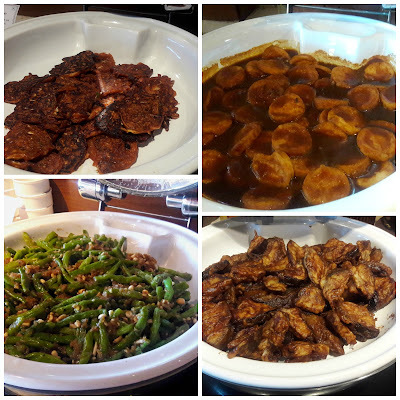 70% of the dishes on the menu are festival-based so someone who wants to have a bite from the regular buffet will not go hungry. Some of the names of the dishes sounded familiar - I had lived at Hyderabad a long time ago. Nostalgia hit me and I decided to concentrate only on the Andhra fare. 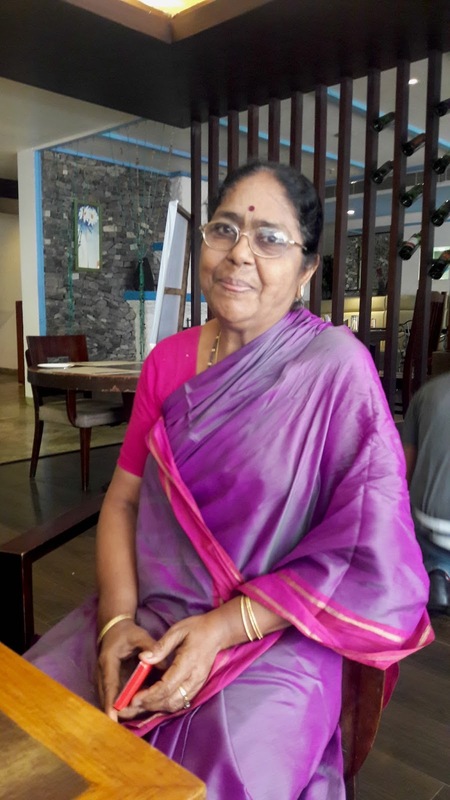 Chef Suguna Rao is the culinary expert behind the festival that features star dishes from Vijaywada, Guntur and Tenali. 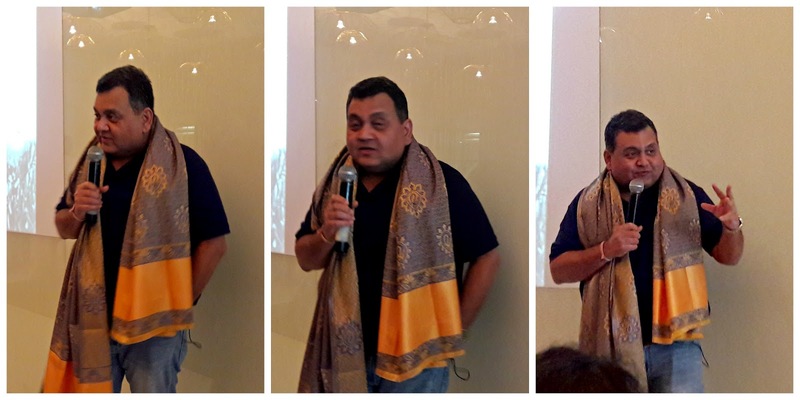 She was not very comfortable speaking in English, so Chef Ashokkumar doubled as translator. I have yet to meet a more self-effacing person and the adage "let the food do the talking" could not be more amply demonstrated. 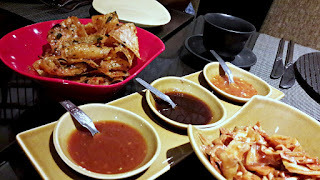 The chef told us that to keep the food authentic, she had sourced all the ingredients, right from those deadly chillies, tamarind and turmeric from AP. In addition, she and her husband are entrepreneurs who make podis, pickles and pachadis at home which are used by many star hotels in the city. There are 6 veg and 3 non-veg starters. Royalla vepudu, a classic fried prawn dish was a good way to start - it brought on tears but was oh-so-delicious and I finished my portion. 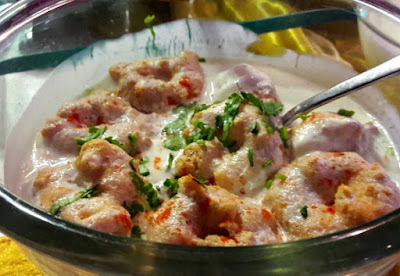 Loved the freshness of the prawns, the bite from the chillies and the zesty freshness of coriander leaves. The Andhra chilli chicken was not as spicy and the cubes of chicken were very tender. 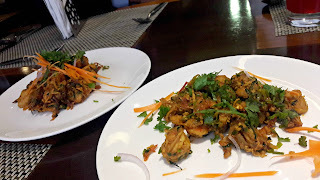 Gunpowder squid, while not an Andhra dish, was another stunner. The rings had been coated with red, spicy masala and fried crisp. 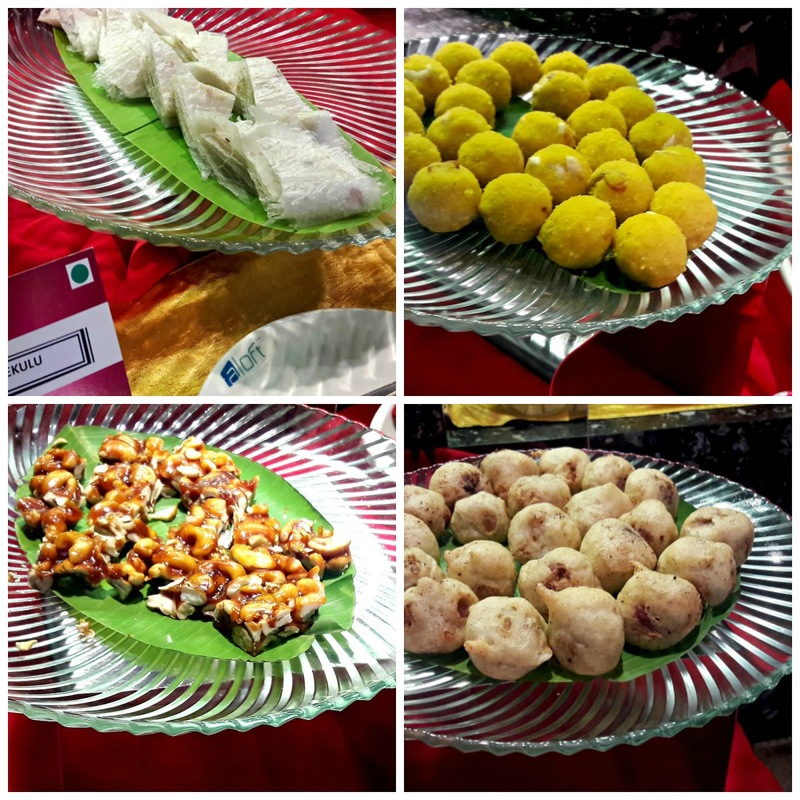 Of the 6 veg starters, 2 were food festival specials - aaku vadalu - tiny little vadais and oats masala punugulu, deep fried lentil and oat balls that were served with a peanut chutney. Surprisingly, none of the starters were oily and and were light on the stomach. 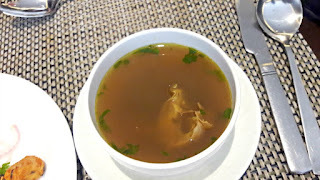 We were served peethala charu - a crab and pepper soup, almost like a rasam. Just the thing if you have a stuffy nose. Perfectly balanced flavours of crab, pepper and other spices which only enhanced the 2 main flavours - that of the crab and pepper. Bobbarla guggillu which is quite like a sundal. Healthy too! There were three meat based main courses - miryala kodi kura - the Andhra version of pepper chicken, a delicious thottakura mamsam - super-soft pieces of mutton with amaranth leaves in a thick gravy. Amaranth leaves added a tinge of astringency but they worked well together; and chepala pulusu - a pleasantly tangy fish in gravy. 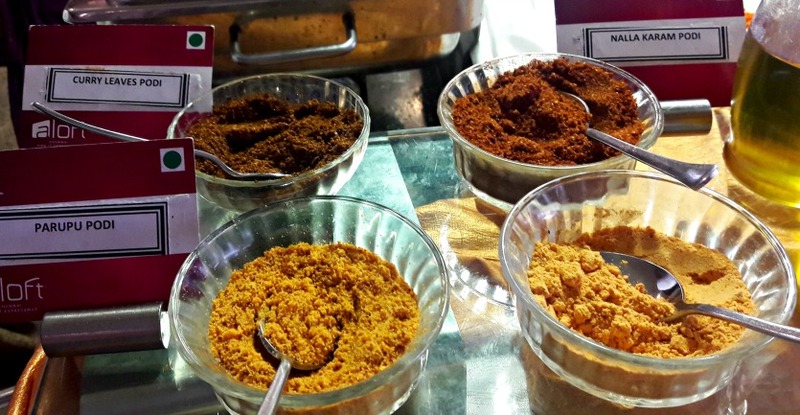 Each one of the dishes was made with distinctly different spices. The fish gravy was so delicious that you could pour it into a bowl and drink it up. And lick the bowl clean. The vegetarian side was equally brilliant - munagkai pulusu - a delightful dish of drumstick in a thick gravy, bangala vepudu - stir-fried potatoes with chilli and dondakaya kobari - gherkins cooked with coconut. 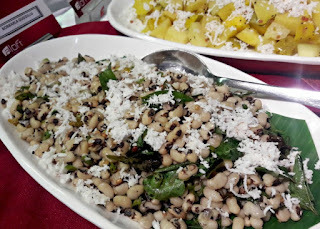 Gherkins are a very popular vegetable in Andhra cuisine. There was also mamadikaya pappu - a deliciously tangy lentil and mango dish. We had pesarattu - a dosa made with green gram that had diced onions as a filling. It was served with ginger chutney and the combination was delightful. 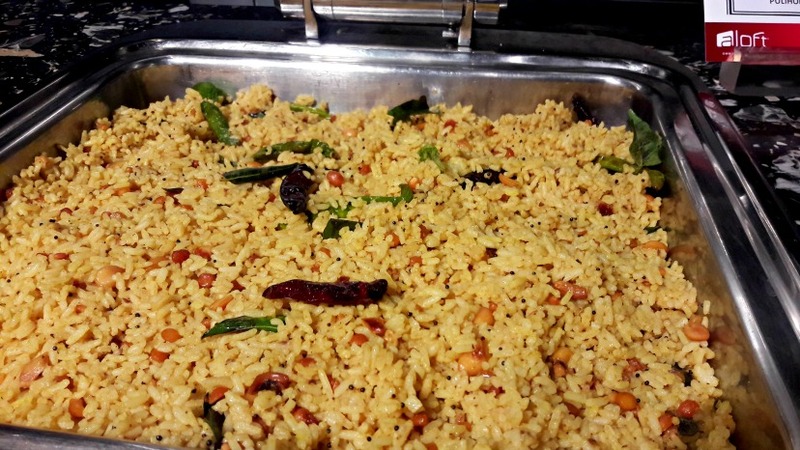 And do not miss another classic Andhra speciality - pulihora (tamarind rice). Plenty of peanuts in this one. In case you like Indian breads, don't forget to order the one stuffed with cheese. 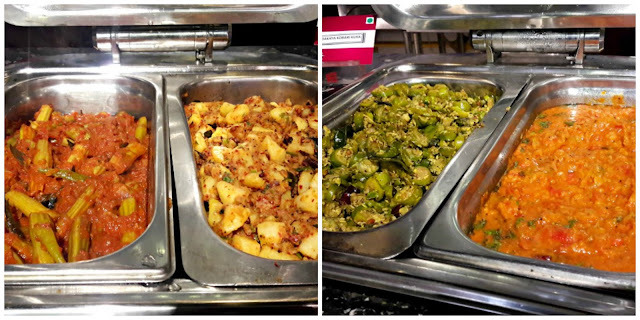 What's an Andhra meal without pickles, podis and pachadis? The gongura chutney was a pleasure to eat, and the Andhra mango pickle was finger lickin' good. So were each of the podis. Chef Suguna's husband told me to sprinkle some of the coriander-based podi on the curd vada. As predicted, it was ethereal. Special mention must be made of the dosakai pachadi - if you like the taste of cucumber on a hot summer's day, you will lose yourself in the flavours of this one. 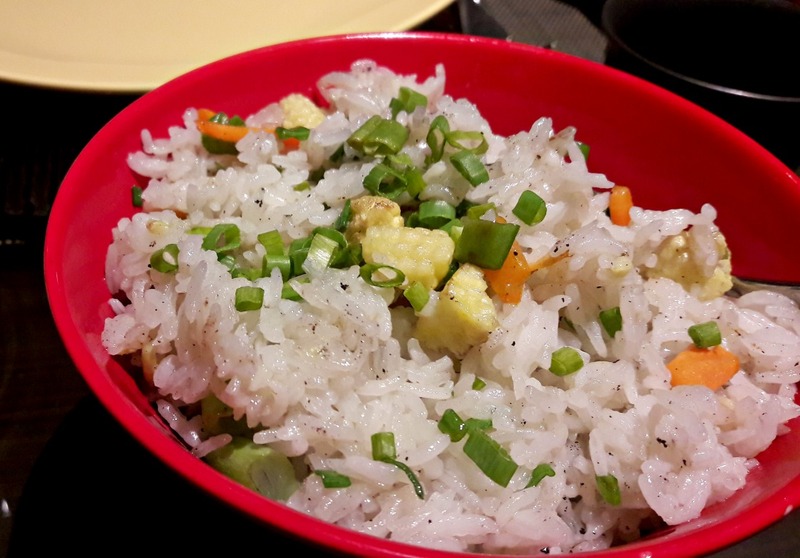 Help yourself to some fragrant steamed rice, a spoonful of ghee and any of the podis. Bliss! 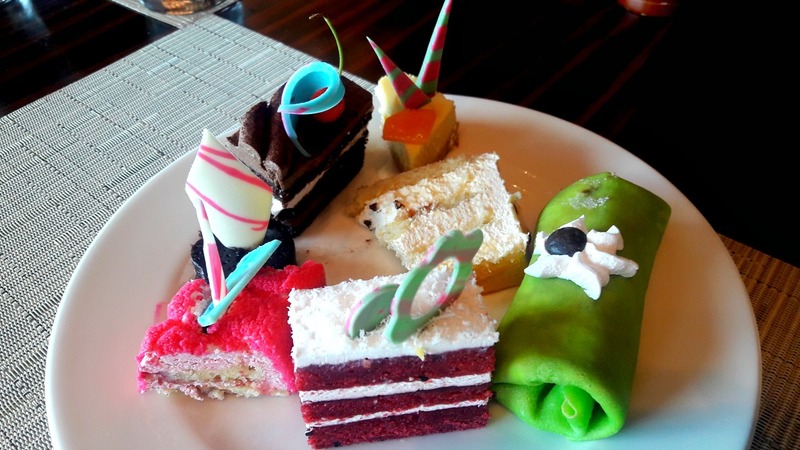 Six Andhra-style desserts are on offer. 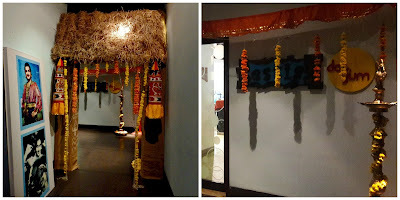 Only the pootarekulu had been outsourced. Loved its flaky, ghee-laden layers. Everything else had been made by Chef Suguna and all of them were delish. 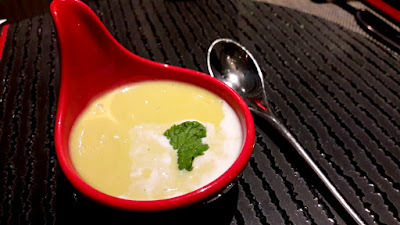 I'm nitpicking here but the only one I didn't enjoy was the pumpkin payasam as it was far too sweet for me. When you cook with love, it shows. 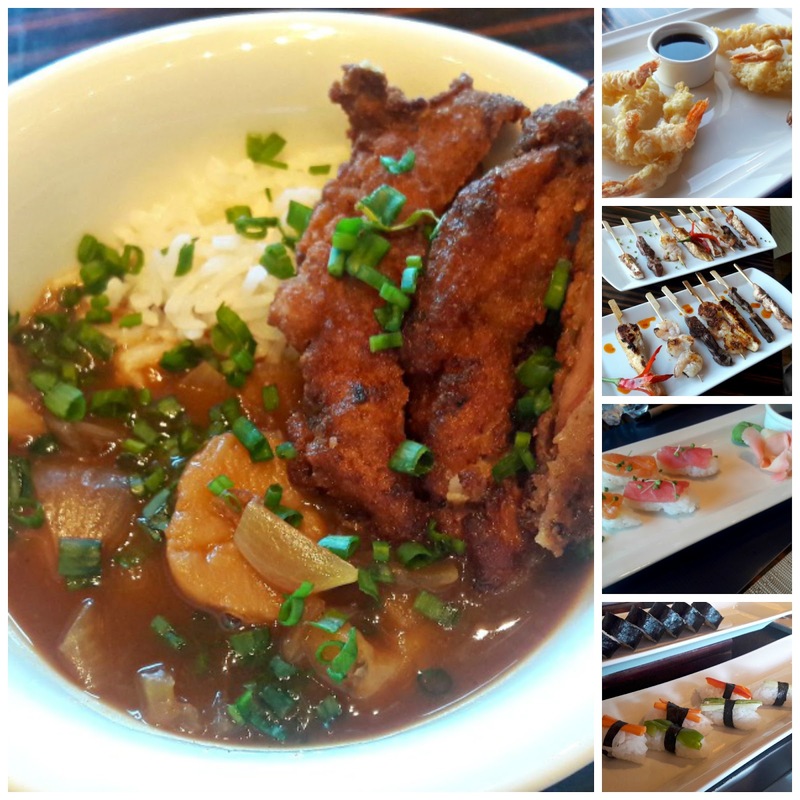 Every single dish had been crafted with care. Except in a couple of the dishes, the spice levels were tolerable and that was because the chef had been asked to keep local palates in mind. 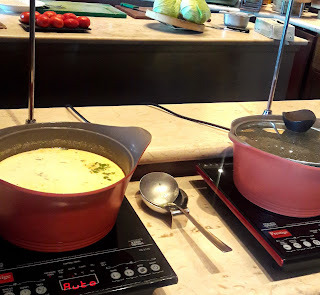 For me, none of the food tasted like it had been made in a commercial kitchen - no excess use of oil or seasoning. In fact, it tasted like a good home cooked meal. And that box of tissues - I took it back home unopened. Kitchen Treasures - Andhra Food Festival is on till 19th June at Aloft Hotel and possibly beyond for both lunch and dinner. Cost of the buffet is 850/++ per head. Do call 9551691676/ 90947 83123 for reservations. Vasco da Gama, Portuguese explorer and discoverer of the sea route to India from Europe. In 1497, he set sail from Lisbon in Portugal and 10 months later, reached Calicut, India. Perhaps Vasco's at Hilton is named after this intrepid traveller. Interestingly, quite a few Hilton Hotels around the world have called their all-day restaurants by this name. Hilton Chennai has introduced Pan-Asian Saturday brunch buffet where Chennai diners are taken on a voyage of discovery through countries in Asia. Executive Chef Achal Aggarwal is at the helm of this voyage and his credentials are pretty impressive. His forte is Asian food and his specialisation is Japanese. 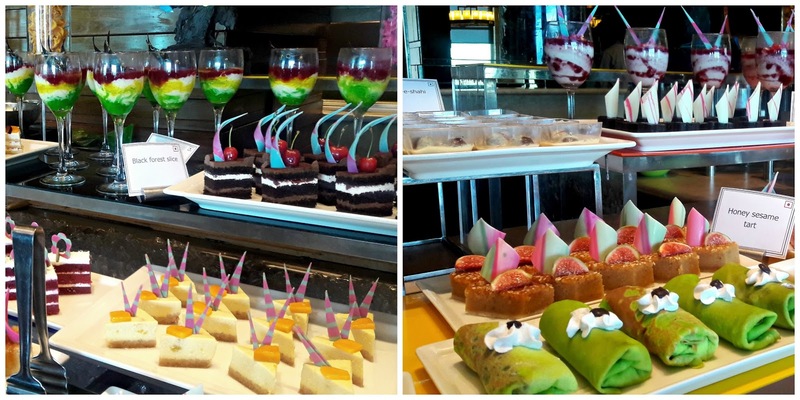 The brunch takes us through Indonesia, Singapore, Malaysia, Thailand, Cambodia, Hong Kong, Korea and Japan of course! Vasco's is on the 3rd floor of the hotel and walking into the restaurant, the layout is meaningful. One has to necessarily pass the salad and the appetiser counters to reach the seating area and the sights and colours that you pass by are alluring. To the right, a flight of stairs leads up to the kids' section and the private dining room. Wooden tables sit on wooden floorboards and food counters are arranged in such a way that even when the restaurant is busy, there's no crowding around the cloches. Checking with the marketing team, I'm told that the interiors of the restaurant resemble the deck of a ship. Hmm...that explains the PDR which has the look of a crow's nest! Large glass windows let in plenty of sunlight and the elevated line of the Metro passes in front of the hotel. Watching trains go by is also a way to relax! The restaurant is pretty full and many of the diners are expats, obviously the new menu is quite an attraction. We're a group of 10 bloggers invited to review the brunch and were welcomed by the F&B and marketing teams. A bottle of sparkling wine was opened with practised ease and passion-fruit Bellinis created. Tart and crisp and a palate cleanser to boot. 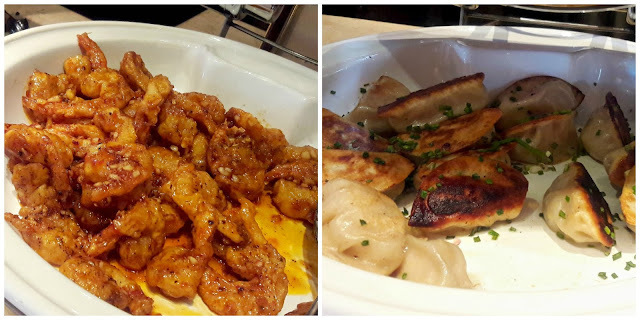 Appetisers included Cantonese spring roll, sweet and spicy shrimps and chicken gyoza. All of them were delicious. 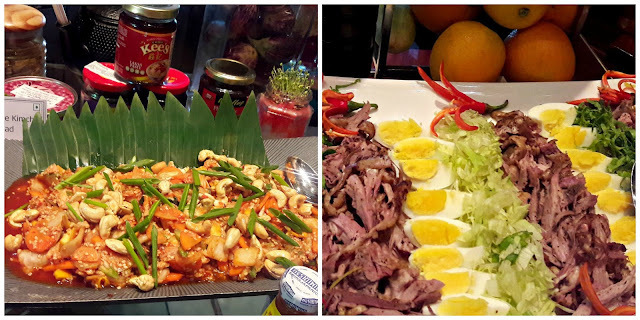 Eight salads on offer including Korean kimchi salad, duck salad with sherry vinegrette and an earthy sweet and spicy mushroom salad. 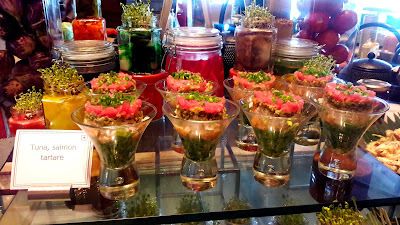 The stand out was definitely the poached lobster salad with succulent cubes of meat tossed in miso dressing. A couple of the salads missed the mark where the dressings were concerned. For the mango addicts, there was a whole section with sliced mangoes of various degrees of ripeness, some even with chilli powder sprinkled over. The soup I chose was tom kha gai - coconut milk and galangal soup with chicken. The chicken was tender though the soup needed more body. 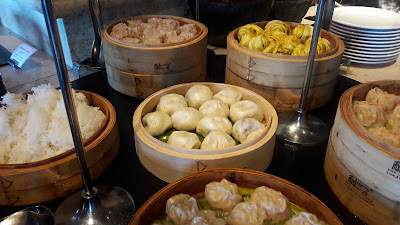 There were bamboo baskets filled with oversized prawn, seafood and chicken siew mai, mantou buns and steamed buns with red bean paste. To a question if pork buns were available, the chef obliged and made them within 10 minutes. Wow - that's service! So many main course choices. From the live station, we munched on chicken, prawn and fish satays. 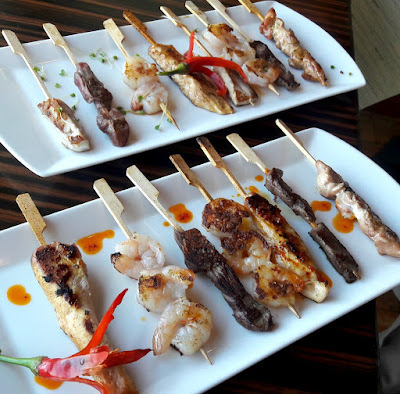 I prefer satay to have more of a char and the flavour when cooked over a charcoal grill is unmistakable which these lacked. The prawn tempura was outstanding - deliciously crisp coating over large fresh prawns. There was also a station devoted to sushi, both veg and non veg. I guess sushi tastes better when freshly made as the nigiri sushi we were served later showed. Drunken chicken - chicken poached in Shaoxing wine, had extremely tender chicken, gave a bit of a buzz but was a little too bitter for me. Three fruit-based cocktails were served through the meal, along with a glass of sake. My plate was a mini representation of Asian cuisine. 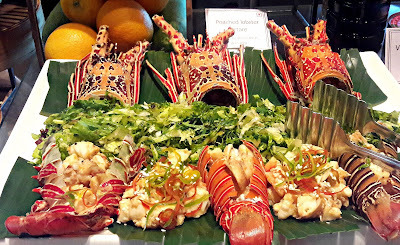 There was steamed jasmine rice, Japanese sticky fried rice (not to be missed), stir fried prawns, lamb bulgogi, Malaysian style rendang (yummy), Cambodian fish amok (delicious fish curry thickened with egg) and Thai asparagus wanton, another cracker of a dish. Only the Phad Thai was much too tangy for me. There was even a seafood paella but I was pretty content with the sticky fried rice. Perhaps it was a good strategy to seat us near the dessert counter. By the end of the meal, we knew exactly what we wanted. Top marks for the basbousa, mango cheesecake, chocolate fudge, passion-fruit gateau and black forest slice. There was a green pancake pretending to be kueh dadar but it tasted pleasant enough. There was also a mango gateau and a warm mango pudding served as specials. How much is too much dessert? 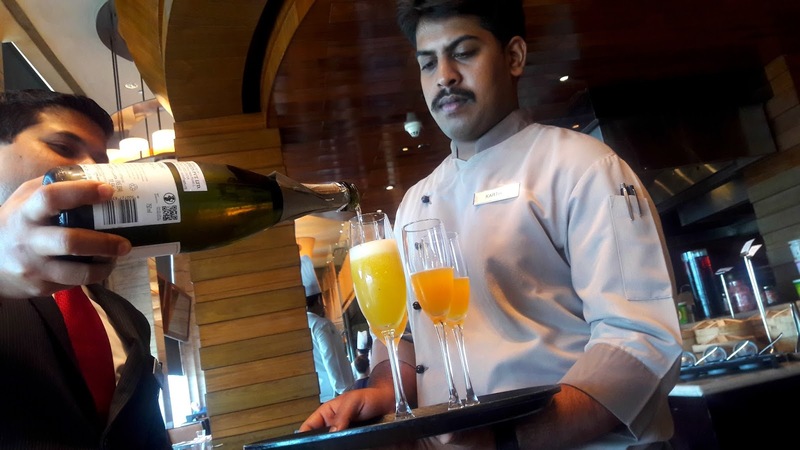 The brunch is impressive both in its extensiveness and variety. Ingredients used are fresh and the dishes are replenished frequently. The serving crew is ready at hand to explain pairings and offer suggestions. *A "Clean Air Programme" that measures the environmental impact of holding a conference or social event at the hotel and an equivalent contribution is given to the Southern Electricity Grid to fund the Tamilnadu 45-Turbine Wind Project. 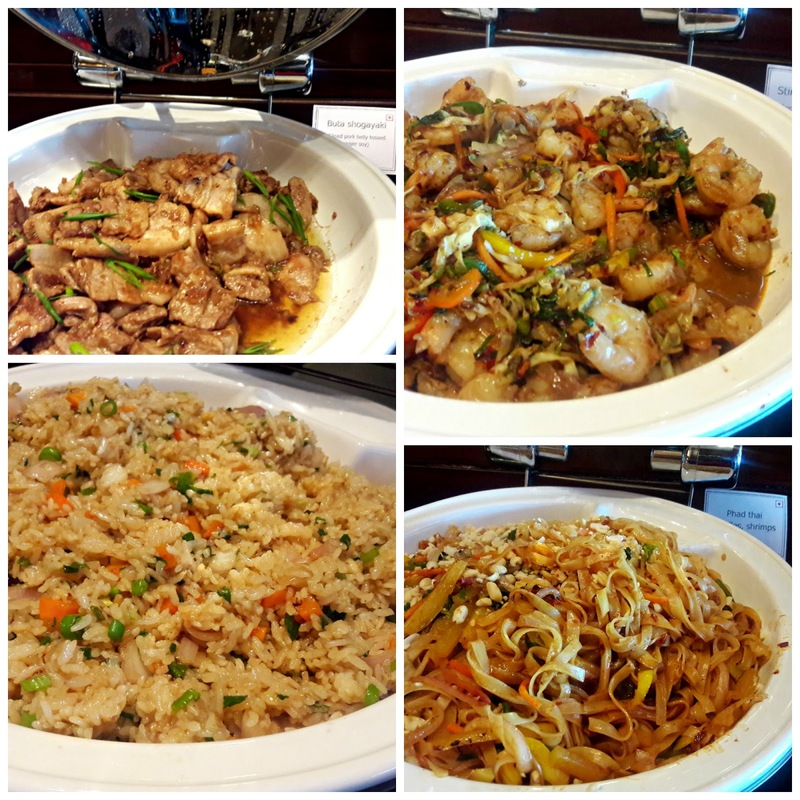 Vasco's Pan-Asian Saturday brunch is from 12.30 - 3.30 pm. Cost of the buffet is 1945/++ non alcoholic; 2345/++ with alcohol. For kids 5 - 12 years, it's 950/++, free for kids under 5. 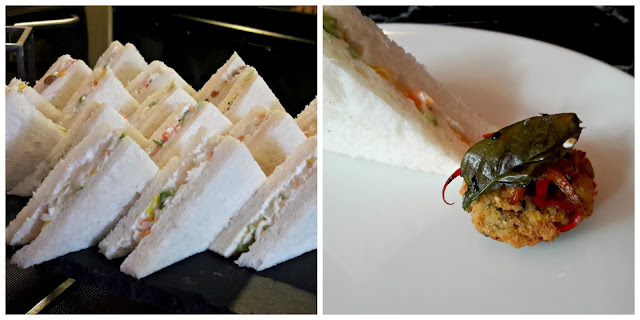 Do call +91 44 2225 5555 for reservations.